(From Olympus lens literature) The ZUIKO DIGITAL ED 50-200mm f/2.8-3.5 SWD is a high-performance super-telescopic zoom lens that features, for the first time, the SWD (Supersonic Wave Drive) autofocus system and covers a zoom range equivalent to 100mm to 400mm of a 35mm camera lens. ED lens elements are used extensively to correct the color blurring that can occur when telescopic lenses are extended to their maximum focal length, while the digital-dedicated design ensures high-definition performance with clear, crisp images from edge to edge. Close-up shooting capability is also superb, with a minimum shooting distance of just 1.2 meters throughout the zoom range. Autofocus is powered by Olympus' breakthrough SWD, enabling this lens to achieve an AF speed about two times faster than the previous ED 50-200mm f/2.8-3.5 model. The ideal partner for the E-3, this lens maximizes that camera's high-speed autofocus capability, and with its superior tracking capability, this lens is ideal for sports photography and outdoor shooting applications. 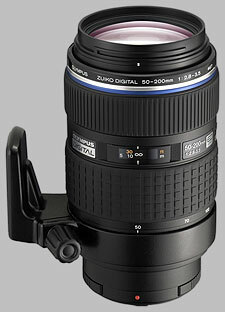 The ZUIKO DIGITAL ED 50-200mm f/2.8-3.5 SWD will be available in December 2007. Estimated Street Price: US$1,199.99. My background : Shot Pentax (K200D, K20D), Canon 40D, Nikon D90, D300, D700, and Sony A850. Advanced amateur. I bought this lens along with the 14-54 II when I moved to Olympus and let me tell you, it's great. So far I've only gotten to use this with the E-30 (rental), while awaiting my E-5 camera to arrive. The lens is sharp. Really sharp. As in, I never worry about stopping down sharp. It's a joy to use and I really like the range. Some people used to cheap kit lenses may think it's heavy, but for me this thing is almost a featherweight (I'm coming from a D700 + Bigma combo: now that's heavy). I have no trouble hand-holding this for longer periods of time with no problems, though I prefer to brace my elbows and sit if possible. Focus is very fast, but can be unsure and jumpy, especially in AF-C mode. This could very well be a fault of the E-30 AF, though, and not the lens - I hope to update this review when I get my E-5 on Oct 22. As a bonus, it's a great macro lens. Not 1:1, but gets pretty close, I think 0.5x in 35mm equiv. The other great thing is you can slap a 1.4x on this thing and *still* be at a faster aperture than Canon and Nikon's 70-300 lenses - of course this one costs a bit more. I have a gallery up, check out http://jl-smith.smugmug.com and click on the "Olympus Test Shots" for pics from either this or the 14-54 II on the E-30. This lens was one of the reasons for me to go back to Olympus after having switched to Pentax last year. For me there is nothing to compare it with, the image quality couldnt really be much better for a Zoom lens, it is weather sealed, the focus is fast and accurate on the E-3, and thanks to the SWD engine absolutely silent. It is expensive, yes...but it's absolutely worth it's money. Difficult to say something, when almost everything is outstanding. The lens size is ways smaller than the Canon 70-200/2.8 IS USM and the weight is significantly less too. The image quality is outstanding. I cannot say anything about the TopPro Lenses but this one is great. The only issue i have, is the price tag. It left a huge hole in my pouch. I was lucky to get a used one. Here in Switzerland the best price you can get is 1800 USD. I finally received this lens after having read others' opinions about it for a couple of months... By now I have used it for a couple of weeks and perhaps 1500 shots. Not that much but I think it should be enough for a fair evaluation. Put simply, the IQ of this lens is absolutely stunning! Sharpness is great corner to corner, distortion is very low and so on. When in focus, images are tack sharp. The focusing, however, is the one issue I've had with it so far. In certain situations, especially low light, it hunts for focus and I've struggled on occasion with AF-C mode. Is that a big issue? No, not really. Everything about this lens is simply brilliant. And given the weight at the equivalent focal range of 100-400 mm, it's quite hard to call this lens heavy. Compared to the Canon or Nikon lenses with the same range it's actually quite lightweight. This lens is even better than the absolutely stunning 12-60 and so close to a perfect 10 that I will let the minor focusing issue pass. Even at a high price point, this lens has to be considered a bargain (again, even more so when compared to the competitors' offerings!). with the new SWD, this lens is really quick at focusing and super quiet. the lens also has great sharpness even when wide open all the way up to 200mm. olympus put this lens in its HIGH GRADE category and I think it's well worth the name. Although the lens does change in length when zoomed all the way out, but it isn't much of a big problem considering that the effective focal length is really 100-400mm. It is quite heavy but my guess it's because of the excellent build quality and the many elements on the inside. oh, and no zoom creep at all.